10/25/18: Michael Shilale Architects, LLP (MSA) was proud to be one of the vendors at the 99th Annual New York State School Board Association (NYSSBA) convention for the 13th year. NYSSBA and the convention they hold allow for great opportunities to learn, grow and connect with like-minded individuals and groups. Following this year’s theme of “New Ideas, New Solutions”, William Miller, president says, “With opportunities to learn from more than 100 educational sessions and featured speakers, 190 exhibitors and 2,100 attendees, you will leave with plenty of new ideas that will help you be part of the solution to raising student achievement in your school district.” This year, Michael Shilale and John Cirilli along with Andrew Lazaro and Matthew Lung of MSA, welcomed a new marketing consultant, Luanne Konopko! 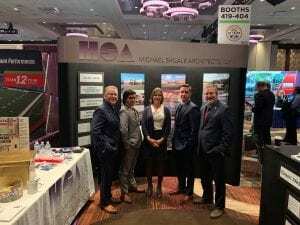 From Left to Right: Michael Shilale (MSA), Andrew Lazaro (MSA), Luanne Konopko (MSA), Matthew Lung (MSA), and John Cirilli (MSA) at the 2018 NYSSBA Expo. Always an advocate behind increasing student success and environment, Michael Shilale Architects, LLP has once again held a lottery for those at the convention for a chance to win a $250 Library Grant. This year’s winner, Ms. Jennifer Reinhardt won for her school, Fallsburg Central School District. Congratulations! For a list of previous grant winners, see below.